Sonar 8.5 contians a surprising number of new goodies. Although it may technically be just 'half an upgrade', Sonar 8.5 feels very much like a proper new version of Cakewalk's DAW. Why? Because it's stuffed with new things to play with - both plug-ins and features have been added to the mix. In fact, you could argue that there's actually more new stuff here than there was in Sonar 8. This being the case, a list of tips for getting the best out of Sonar 8.5 seems very much in order, and MusicRadar is here to provide it. For a complete guide to the software, check out the January issue of Computer Music (CM147) which is on sale now. Sonar inspires a lot of very cunning ways in which to manipulate your vocal tracks. While you might immediately think of using V-Vocal to adjust the timing of a vocal, don't overlook the possibility of also using AudioSnap 2 to correct wayward timing. Better still, use it creatively, chopping and rearranging your vocal tracks into something entirely new. The new VX64 Vocal Strip is very slick indeed. However, it can be tempting to overuse the thing, squashing the life out of your vocal tracks. When you need to apply a double-dose of compression, try this old producer's trick instead: apply two instances of the effect, each set to more moderate compression ratios and thresholds. In fact, why not go one further? 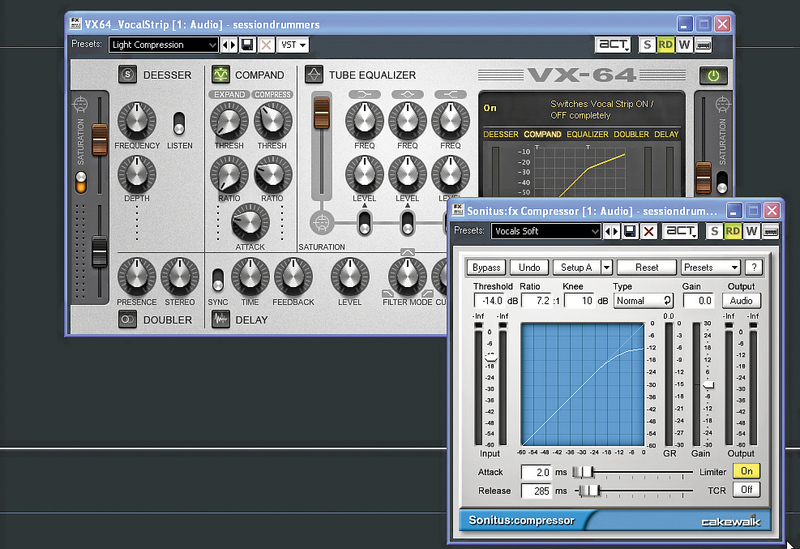 Try using the VX64 in line with another compressor, such as the Sonar-bundled one from Sonitus. We showed you how the Matrix View can be used to mix and match various Groove Clips, but don't feel as if you must always lock every clip to the beat. There is some appeal in letting a few of your tracks flow free from the tyranny of beat division. Try loading in some seemingly random, ambient noodlings and triggering them alongside your percolating sequences and thumping drum loops. You'll be surprised at how often they seem to fit together! Vocals are, of course, the focal point in any song that features them. Sonar 8.5 comes with a wealth of effects that might not at first seem like obvious choices for a vocal track. For example, try strapping the HF Exciter across your vox to make them jump right out of the speakers, or give them an industrial edge with the Alias Factor Bit Decimator. Why not? 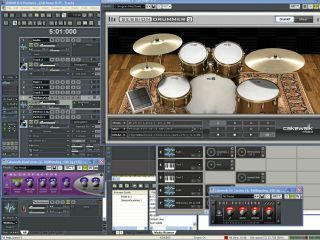 Have you taken a look at all of the different sorts of files that can be imported into Session Drummer 3? Everything from FLAC to WAV and SFZ can be used, and a lot more besides. So here's a crazy idea: why not subvert the format by loading in things that wouldn't necessarily be used for drums? Snippets of guitar, bass, voice or found sounds might be quite interesting when used in conjunction with Session Drummer's many excellent drum patterns. We're trumpeting the HF Exciter again, because you simply must try the thing on your drum tracks. Sample designers have been adding some grit and presence to their drum loops with aural exciters and sonic maximisers for absolutely years. You can take a tip from them and spice up even the coldest drum recordings with the HF Exciter in much the same way. Session Drummer comes with loads of excellent, pro-quality drum patterns, but that doesn't mean that you can't just as easily whip up your own if you have a mind to do so. The drummers among you might use a set of V-Drums or even something like the pads on your MIDI controller to knock out some custom patterns. Come to that, we think Session Drummer would make an ideal companion to a MIDI drum kit. What's more, anything you create can be saved and reused. Those of you who don't play the drums can use the AudioSnap function to steal the feel of drum tracks, then convert them into MIDI files that can be used with Session Drummer or even the Step Sequencer. There's a handy button in the AudioSnap palette for this very purpose. Give it a shot - but be sure to clear those copyrights for commercial uses. 9. What is the matrix? The Matrix View makes it easy to jam out quick remixes with little more than a few mouse clicks. However, more fun awaits. Hook it up to your favourite MIDI controller and turn your remix into a full-on performance. There's a handy one-step capture function that instantly sends your jamming over to the Track View for further editing. Each of the Matrix View's rows get plumbed directly to a track, but you can also pile up multiple rows and send them to a single track for combined editing and treatment. This is terrific for either over-the-top processing or stacked percussion grooves, for example. Though the design of Step Sequencer 2.0 seems to be aimed squarely at producing drum tracks, there's nothing to say that you can't use it on something rather more tuneful. You could, for example, create some interesting bass patterns and melodic events with it, or even load a bunch of disparate waves into your sampler of choice for a spot of pseudo wave-sequencing. Here's one for Sonar Studio owners: try using V-Vocal to create complex multi-part harmonies using a single vocal track. Just copy the track a couple of times, give it the V-Vocal treatment, then nudge the notes of one copy up, say, four semitones, and the notes of the another up to create a seventh (or down to a fifth, for that matter). Or create complex, ever-changing harmonic relationships between the copies. Push the timing around a little, too, for more realistic vocal comps. And don't forget to use the VX64's slapback delay!